Coming from 95 north, the location is on your left side of Route 1. It looks like a house with a Pizza sign, but turn in anyway, the skating center is actually BEHIND the pizza place. Generally speaking, admission is $6, skate rental is $2, Roller Blade rental is $3, and “PlayZone” admission is $3. They do take credit cards. Admission includes a slice of pizza and a small fountain drink. You can check for daily specials on their website. Are you ready for the worst iPhone pictures I’ve ever posted? Are you sure? I warned you! So, obviously it’s dark inside 🙂 There are lots of lights going and you even get a little black-light style glow to any white clothes that you’re wearing. The floor is flat and surrounded by carpet, which is actually a nice way to start your new skaters out. My ice skating boys opted for roller blades and did just fine with them, but my little figure skater had to resign herself to 4-wheeled skates because the roller blades don’t start until size 13. Right next to the skate rental area is the play zone. You can almost see it in the junky iPhone picture above. It’s an extra $3 to use, and I refused to pay for it, but my kids didn’t seem to mind or even ask about it until it was time to go and they’d taken their skates off. There are also numerous arcade style games around that require tokens, which you need cash to get, so if you’ve got a gamer, plan on at least a little cash so you can get your tokens. Oh, look! A decent picture from the Cavalier website. At the opposite end of the rink there’s a linoleum area with the cafe, more games, some seats, and a party area. Word to the wise, the linoleum is SLIPPERY, especially for new skaters. That first step from the carpet or wooden skate floor to the linoleum is a doosey! As far as cons, I’ve got to be honest, this place has seen better days. You can’t really see this picture well, but it’s an image of where the carpeted benches meet the carpeted floor. That white looking line is about 1/4 inch of chunky dirt that runs around the entire perimeter. The day we went the water fountain was missing 2 of its 3 “push here” covers, so there were just holes in the fountain where they should have been, and there was a bench top missing from one of the tables in the cafe area, so there was just bare metal left. The floor to skate on was definitely clean and smooth, and the kids had a really great time skating, but if I kept my Dyson in the back of my car, I would have busted it out for awhile. 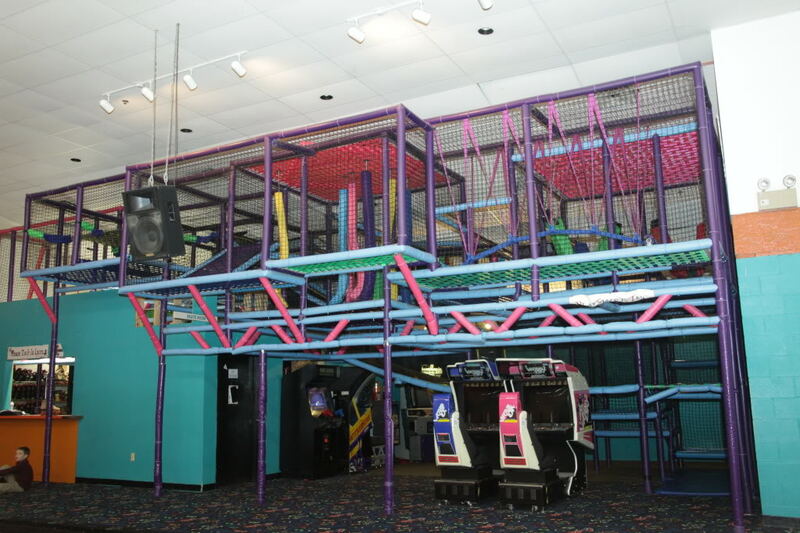 In addition to school groups and camps, the roller skating rink also offers birthday parties, which are currently priced from $129-$199 for 9 guests plus the birthday child. Pros: Admission fee is good for the entire day, lots of special event skates. Indoor option that keeps the kids moving, all 3 of my children (4, 6 and 8 years old) had a good time. The weekday we went it was basically empty. Cons: Extra cost for play area, facility needs serious cleaning. Recommended for: A day inside, but be sure to bring some hand sanitizer when you’re done.